Tomatoes home-grown from seeds ultimately reward the effort it takes to grow them, with delicious fruits and self-satisfaction. Once planted indoors, your seeds are just a few days away from eagerly sprouting up through the soil. At that happy moment, be ready to take immediate action, to ensure they withstand the elements when you move them outside. One of the most important tools in the struggle to raise healthy tomato plants from seeds is a portable fan. This simple device circulates air constantly and simulates outdoor winds, which serves to strengthen the developing seedlings, as well as aid in disease prevention. Set your tomato seedling starting tray or flat into a shallow pan as soon as they sprout. It’s best to provide bottom watering at this point. Place them about 4 inches below a 4-foot shop light right away. Keep the lights on for 12 to 16 hours daily. Place a small portable fan about 6 feet away from the sprouts. Turn it on the lowest setting and point it slightly above but not directly onto them. The idea is to provide good air circulation in the area. Moving air provided by your fan will remove excess moisture if the planting medium becomes too wet for the seedlings. This will go a long way toward preventing post-emergent damping off disease. 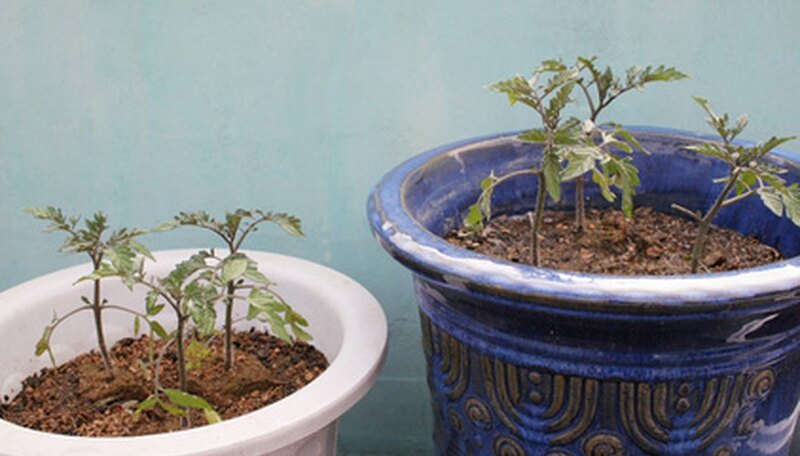 The disease is fatal to newly-sprouting tomato seeds and produced by overly damp conditions. Brush the tops of the tomato seedlings very gently with your fingertips every day. This will awaken them to the fact that life on the outside won’t be as easy as it is in their protected nursery. They’ll respond by growing into stocky, durable plants in order to adapt to and survive your brutality. Maintain critical air circulation with the fan. Continue this treatment until you plant them outside. Step the seedlings up to 4-inch pots when they’re about 2 inches tall and the first set of true leaves develops. Use the same sterile medium you started the seeds in. Plant them deeply so that only the true leaves remain above the soil line. This will cause them to grow roots from their underground stems. Reduce the temperature for your seedlings to between 61 and 69 degrees F. Begin moving the fan about a foot closer to them once each week until it’s about 2 or 3 feet away from them. This will gradually make their living conditions a little more rugged. Keep the setting on low and the flow of air indirect. Feed tomato fertilizer once weekly, diluted to about one-quarter strength. Follow the packaging instructions carefully. Good air circulation from your fan will prove to be especially invaluable once you begin fertilizing, which produces rapid growth. This will prevent the seedlings from becoming leggy and flimsy. Point the fan directly onto the seedlings for a couple of hours each day when they’re about 3 to 4 inches tall, but keep the speed set on low. Redirect the air flow away from them for the remainder of their indoor hours. The plants will begin to develop sturdier trunks, just as a tree does when exposed to constant high winds. This conditioning is necessary so that your tomato seedlings won’t wither and die as soon as you expose them to the great outdoors. Set seedlings outside in the shade for a couple of hours each day beginning about a week before planting them. This is called “hardening off." Keep the fan circulating air for them during their indoor time, with 2 or 3 hours of air blowing directly on them daily. Gradually increase their outdoor time and begin acclimating them to direct sun over the course of the week.